This is the summary of consumer reviews for Bright Starts Grab and Stack Blocks. The BoolPool rating for this product is Excellent, with 4.60 stars, and the price range is $7.99-$8.99. The Bright Starts Grab and Stack Blocks is a set of four soft and squishy blocks that feature different patterns and characters on each block. This infant play toy focuses on three of the five main senses - touch, hearing and sight, appealing to a baby's natural curiosity. A couple of blocks rustle, while a couple come with a bell inside them and jingle when babies shake them. The blocks are awash in vibrant colors, numbers and alphabets, and are great developmental toys for the crawlers or the soon-to-be movers and shakers! The textured blocks are also easy to grab and hold. These fabric entertainers are safe missiles that can be thrown at your walls, furniture, TV (and umm, even you!) once your child learns the art of pitching! They can also help develop motor skills when little ones learn to transfer them from one hand to the other or when they stack them to make a tall tower. Of course, the fun intensifies when the tower tumbles with all the bells and whistles! The crumbling blocks are safe for babies as they are cloth made, but some reviewers encountered 'sharp-ish' edges in some of the blocks. Their advice: to trim it or bend it till it wasn't so sharp. Then it's good to play tumbling towers again! Though these blocks taste a bit funny, they are perfectly chewable once they've had a trip in the washing machine and dryer! Many customers either stuff these blocks in a pillow case or a lingerie bag while washing them using a mild cycle, to help retain the shape. Overall, the Bright Starts Grab and Stack Blocks is a great set of four stimulating blocks that gives you good value for the money you pay. (Some moms and dads even wish they would come in larger packs!). Be it a missile or teething toy, this durable plaything can put up with any wear and tear. And the icing on this square material cake? They are portable, taking up little space and have loops on them for easy attachment to strollers or car seat toy clips. Need more???!!! safe, good price, quality material. These are half the price of most others, easily the best looking, and have krinkles, jingles, tags, and other 3d things sewn on. I got at Target but this (Amazon) is the best price. I saw something similar in a store but cost more money I checked Amazon after seeing them at the store and ordered them they're actually better then the ones in the store and a cheaper price. These are half the price of the Taggies version and do the same job. Bought these blocks for a great price.When I received them I was pleasantly surprised to see how well made they were. I wish all pieces had a jingle or sound but for ten bucks you can't go wrong buying this!. Love the graphics and color. My 4.5 month old daughter loves these! We love these big soft blocks! My son loves these blocks. He loves the colors and the noise they make when he squishes them! Perfect for playtime and learning letters, numbers and colors. My daughter loves the blocks and I did too. They're bright and colorful and have super cute images and designs! My 5 month old loves to grab for her blocks. He also loves the crinkling sound and other textural items sewn in. One of my 7 month olds favorite toys. This's a great toy for 3 - 9 months. They're still my son's favorite toy. I prefer wood or cloth toys to plastic so I love that these are soft and crinkle and have tags. They've different textures and make different sounds and are perfectly fine as a tactile toy. Well these toys are great for that then. Good toy and good price. Scared of leaving baby with toys alone because they might knock their head? My daughter's loved these since she was 5 months old. 2 of the blocks jingle and 2 crinkle. Two cubes have sounds (different bell like sounds) and two cubes are rustling. They've great, different textures for Baby to touch and a fun crinkle sound. 4 brightly colored blocks -- 2 have bells and 2 crinkle -- my daughter prefers the crinkly sound but plays with all of them. The different sounds, textures, and bright colors were an instant hit!. #1 sounds like there's a plastic bag inside and makes an awesome crinkling sound that keeps him busy and happy! Two have bells inside and 2 are crinkly sounding but all are soft and easily grabbed at. With all the different sounds they keep the attention of our 3 month old grandson and he his little fingers can grip and hang on to the binding on the edges really well. Two of the blocks are paper crunchy sound and two have bells inside. The bell and crinkle sounds built in are good for grabbing baby's attention but there's too much other stuff on the sides of the blocks to be really good at teaching much. My daughter is still too young to play with these blocks properly but she likes the sound they make when pressed. These soft cloth blocks are just the right size for little hands. There are little tabs of material for little hands to grab onto also. He can grab them so easily with his little hands. These blocks are great-soft and squishy so they're safe for little hands but also fun with the bells and crinkly noises. Do wish they were a bit smaller for her little hands. They're brightly colored, have little tags on the sides for little hands to grab, they crinkle, etc. They aren't too big or small - just the right size for little hands. These are good blocks and they keep our 8 month old daughter's attention for a little bit. They make crinkely sounds that babies really love. My baby absolutely adored these soft little blocks. Like with new baby clothes, this toy requires a washing before the baby can play with it. Baby likes these stack blocks. these are soft toys with perfect bright colors. 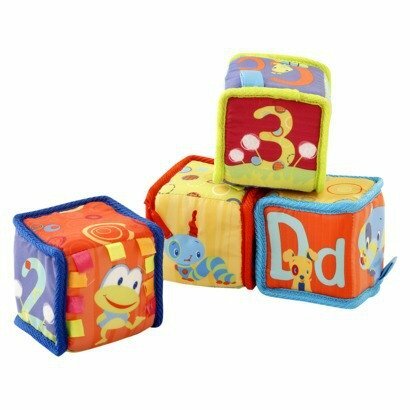 These blocks were one of the first toys my babies enjoyed holding and transferring from hand to hand. They've kept my twin baby girls entertained for months now, and they love the different sounds and textures. While they're easily stacked by babies old enough to start putting objects on top of each other, they're also soft, soft, soft. Also when the baby grabs the block it also makes a bit of a crinkle sound which is one more thing that works great for the baby.